In my last post on bubble economies I mentioned that the federal government is moving away from a social services model over to a medical services model. As fate would have it, I just received the February issue of the FUNDED newsletter, which is put out by Grant Office. 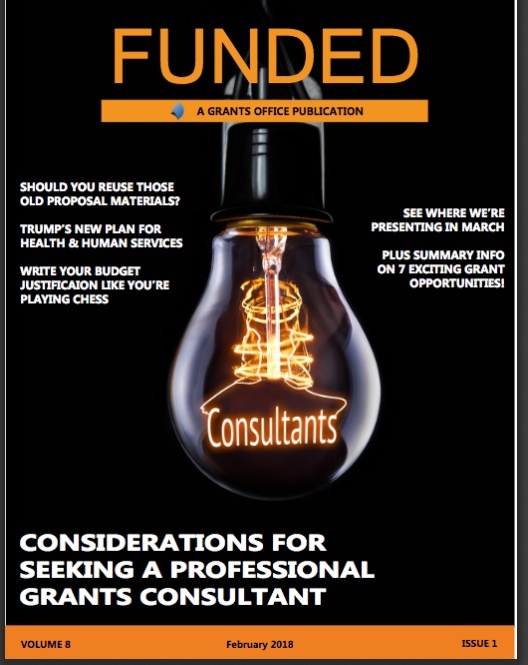 This issue has an article by Chris LaPage entitled “The Department of Health & Human Services: A New Strategic Plan & A New Vision.” This article describes the shift I point to, and has a number of good suggestions for social service organizations as far as weathering the storm and securing funding within this new paradigm. I reached out to Grant Office and was able to secure permission to reprint this very helpful and informative article. Many thanks to Grant Office. With no further ado, here’s the reprint (sans a couple of accompanying pictures). I would suggest that this is a “must read” for any social services organization. Applicants are always striving to make their proposals compelling in an increasingly competitive environment. One of the most important tasks that is recommended during the due diligence phase is to familiarize yourself with the funder. A key information source for this activity are the four-year strategic plans that federal agencies are required to make publicly available to comply with the Government Performance and Results Act (GPRA) of 1993. Unfortunately, the current strategic plan for Health and Human Services (HHS) that was established in 2014 under the Obama Administration is set to expire in 2018. The plan for 2018 through 2022 is currently under development by the Trump Administration; however, there is much to learn from the draft they published for comment in Fall 2017. To project how things may change, it is important to understand the existing playing field. The current HHS strategic plan that went into effect in 2014 was developed during the Obama administration. As such, the underlying theme of the plan was the continued implementation of his signature legislation, the Affordable Care Act of 2010 (ACA—also known as Obamacare). The ACA recognized a large role for government in the establishment of health insurance exchanges and was laser focused on increasing insurance coverage. As a result, applicants seeking funding through the various HHS grant programs were encouraged to focus on increasing access to healthcare, while prioritizing low-income populations and those with government-provided insurance (e.g. Medicare, Medicaid, Child Health Insurance Program). In addition, projects that incorporated long-term sustainability plans to include both public and private insurers were viewed favorably. While each of these goals are accompanied by four objectives each, the draft plan did not contain any performance measures. It seems unlikely that the new plan, once finalized, will be void of performance measures—as those measures will be an essential in how HHS defines success over the next four years. In that respect, there will still be much to be learned from the final plan that is produced. The real differences between the current and pending plan is not in the goals themselves, but rather in how the agency will implement these goals and how they will be measured. Fortunately, the text of the draft that was published for comment does provide some clues as to how HHS’s approach will be different under the Trump Administration. Some of the common themes include stressing faith-based institutions, personal responsibility, and private market solutions [emphasis added]. While the previous administration was focused on ACA implementation and an expanding role of government in healthcare, the opposite will be true going forward. This has been made clear by President Trump’s statements and recent actions—such as the elimination of the individual mandate associated with the ACA that required people to have health insurance or risk a fine. The provision striking down the individual mandate was included in the recent tax reform package. As a result, we may see grant programs prioritize projects that can move folks away from public health plans towards private insurance companies. In addition, we may also see a discontinuation of grant programs that funded outreach and enrollment into public programs like Medicaid, Food Stamps, and Temporary Assistance to Needy Families as the administration seeks a free-market (rather than government) solution to these problems. The 2018-2022 plan’s emphasis on the role and involvement of faith-based institutions goes hand-in-hand with its focus on private markets. It is likely that we will see specific language in future grant program solicitations that explicitly makes faith-based organizations eligible or requires collaboration with such entities. Interestingly, many of these agencies have always been able apply for HHS grant programs given that they were eligible as non-profit organizations, but there has not yet been an emphasis on proposed projects needing to include these organizations. The administration may look for projects that allow faith-based organizations to expand their role in providing health care and other human and social services such as food distribution, child welfare, and adoption services. The overall idea being that an expanded role for faith-based institutions in this arena will result in a lesser need for the role of government-provided services. Whether or not the new plan will require these faith-based institutions, if grant funded, to use the dollars for only secular-oriented services has yet to be determined. The other major theme in the new strategic plan is the notion of personal responsibility in health care. Historically, healthcare has been an industry that is unique in that the recipients of services (i.e. consumers, patients) often are not directly involved in paying the full cost of their care to providers (e.g. physicians, hospitals). Government and private insurance play the role of payors instead. The proliferation of high deductible insurance plans, co-insurance and other mechanisms work to close this gap by shifting responsibility to the patient. The free-market approach assumes that individuals will make more economically appropriate decisions on health care utilization when they pay for it like other services and goods. In that respect, it appears there will be an emphasis on funding grant projects that follow this trend. Advocates for this new approach argue that the closer the patient is to payment, the less likely they are to seek unnecessary and costly medical treatments. This is a contrast to the 2014-2018 plan which championed ensuring access to less costly primary and preventative care in the hopes that individuals would be less likely to need expensive emergency services. 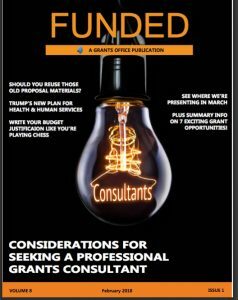 It is crucial for future grantseekers that are targeting HHS programs to familiarize themselves with the 2018-2022 plan once it is finalized. Pay particular attention to any performance measures that are included, as these will provide key insights into how HHS is going to be evaluating future success. Many grant programs are tied to specific pieces of legislation and their priorities are coded into law, which will provide some buffer to the changes in the overarching HHS Strategic Plan. However, HHS and the agencies under their umbrella also have a tremendous amount of leeway in how they implement their grant programs and how they evaluate applicants. Finding ways in which your proposed projects mesh with the priorities laid out in the plan will be crucial to your success as an applicant.